New student orientation sets the tone for students’ comfort at their new school and teaches them that this is either a place to be real about their mental health on campus—or a place to pretend that they’re OK when they’re not. I’ve spoken at hundreds of new student orientations over the past twenty years, but this year is different: Soon, I’ll be dropping my own oldest son off for his first year of college. Suddenly, new student orientation isn’t just a chance for me to inspire other people’s kids—it’s a vital piece of my interaction with the college that my son chooses to attend, and it has the power to set him off on the right foot for the next four years. I’ve also noticed something that saddens me in the past few years of speaking at colleges. More students than ever line up to talk to me after my keynote, and it’s not because I’ve gotten better at speaking recently. They all share similar stories of anxiety, depression, self-harm and even suicidal thoughts. Now more than ever, universities’ responsibility to equip and care for students is a life-or-death matter. First-year students have the next four years to look forward to sitting in lecture halls. At their new student orientation, provide them with interactive experiences to ease their “I’m new here” jitters, introduce them to their new best friend and give them the tools they can really use on campus. In my keynote, Living Life at Performance Level, I use five different kinesthetic activities to get students up and moving. But they all illustrate a key point: For example, juggling teaches them to fail successfully: we’re all going to drop the ball, but how we respond to that is the key to success. Simon Says teaches them to be response-able, stopping and thinking before they act. Many students come into college after coasting through high school or being handheld through their education by parents and teachers. They’ll have a range of independence, from students who are used to writing and completing assignments on their own, to students who always had help. You’ll also have a range of attitudes in your new student orientation crowds, from students who are decked out in your spirit wear to those who are at their third-choice school. All types of students need to hear one thing: They get to decide what their college experience will be like. They are the director, the playwright and the star of the next four years. My keynote centers around this metaphor, and it’s especially helpful for students beginning a brand new “act” in their life show. Level the playing field at NSO by teaching all students a new skill. For example, I guarantee that I can teach everyone in the audience to juggle in just a few minutes. While there’s always a few outliers in the audience who can already juggle, it’s a great opportunity to remove students’ mental blocks against things they can and can’t do. Here’s a spoiler: If you believe that if you fail enough times you can master something, you will. When a student is struggling in a Calculus, English writing or Spanish course, my hope is that they’ll remember the mental shift I taught them through juggling at new student orientation and approach each new skill with tenacity. Don’t let them leave new student orientation empty-handed. I give all audiences of new students the juggling balls that they practiced with. It reminds them that in order to succeed, you must fail and it gives them a healthy study break activity, too. There are few times more vulnerable in a young person’s life than the first few days at college: They’re leaving all of their friends, their parents and their home behind to live in a dorm, share a room with a stranger, take challenging courses and make new friends. Open up the floor for honesty and vulnerability by bringing in someone who will share their own real-life story. It’s powerful to have a speaker who breaks down these barriers, but it’s also powerful to have a current student give their perspective on balance and overcoming challenges. No doubt, students’ heads are buzzing by the time they make it to the end of new student orientation. Don’t underestimate the power of giving them time to take it all in. For example, at the end of my keynote, I give space for students to reflect on the mentors who helped them get here and how students can now pay that forward and positively influence others. You only have one chance to make a first impression—and new student orientation is an incredible opportunity to speak directly to incoming first-years while they’re all in one place. Don’t waste it! 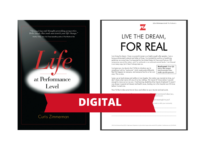 This eBook version of Life at Performance Level and the companion workbook will guide you to create the life of your dreams.